Port Moresby: ExxonMobil PNG Limited, operator of the PNG LNG project, has signed a funding agreement with the Central Provincial Government Education Division to help roll out School Board of Management training in Central Province. The training program uses a manual developed by Esmie Sinapa Development Consultants and funded by ExxonMobil PNG with support from the Central Provincial Government in 2016. The School Board of Management training manual is aimed at improving school board governance and leadership capabilities and its development involved extensive consultation and pilot training with boards of management from schools near the LNG Plant. A total of K300,000 has been allocated for the next two years to help deliver the program across Central Province through training for boards of management, train the trainer, ongoing monitoring and evaluation and dissemination of the manual and learnings. ExxonMobil PNG Managing Director Andrew Barry thanked the Central Provincial Government for their support to develop the training and commitment to ensuring the benefits are spread more widely to schools. “Good governance and leadership in any school is fundamental to providing quality education to students. Strong and effective boards help to guide teachers’ and students’ performances and similarly increase the quality of administrative functions at schools,” he added. Rollout of the training program over the next two years will be conducted by Esmie Sinapa Development Consultants. ExxonMobil PNG is also helping to facilitate an extension of the Board of Management training program to Hela Province schools. Earlier in April about 30 representatives from Hela Provincial Government, Administration and Division of Education completed introductory training in Tari with a further nine project area schools identified to trial the program later this year. ExxonMobil PNG has invested a total of 21 million Kina in education on infrastructure development including teachers’ houses, classrooms and desks; learning materials, education scholarships and capacity building for teachers in PNG LNG project areas since 2011. Photo: . 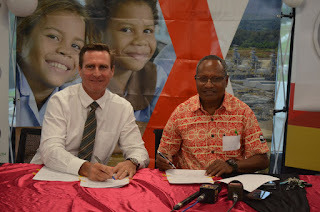 DSC 0233 - ExxonMobil PNG Managing Director, Mr Andrew Barry and Central Provincial Administrator, Mr Gei Guni Raga signing the funding agreement.